After gaining just 50 yards on 33 carries, the Cleveland Browns are anxious to get the run game going against the Buffalo Bills in preseason action tonight. BEREA, Ohio -- The Cleveland Browns had few problems when it came to moving the ball down the field through the air against the New York Giants in the 2018 preseason opener at MetLife Stadium in East Rutherford, New Jersey last Thursday night. However, the same could not be said for the running game, as the Browns rushed for just 50 yards on 33 carries, an average of 1.5 yards per carry. As such, the run game was a big point of emphasis for the Browns in practice leading up to tonight’s preseason home opener against the Buffalo Bills at FirstEnergy Stadium. Cleveland Browns running back Carlos Hyde hustles down the field after catching a pitch in a drill during an OTA practice at team headquarters in Berea. 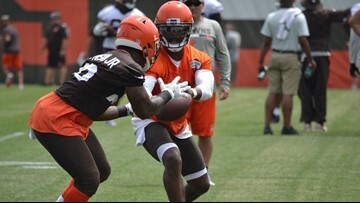 Cleveland Browns running back Duke Johnson Jr. squares up to catch a pitch from quarterback Tyrod Taylor in a drill during an OTA practice at team headquarters in Berea. Cleveland Browns rookie running back Nick Chubb sprints down the field in a drill during an OTA practice at team headquarters in Berea. Cleveland Browns running back Carlos Hyde reaches to catch a pass in a drill during Organized Team Activities practice at team headquarters in Berea. Cleveland Browns running back Duke Johnson looks for a rushing lane before taking a handoff in a drill during an OTA practice at team headquarters in Berea. 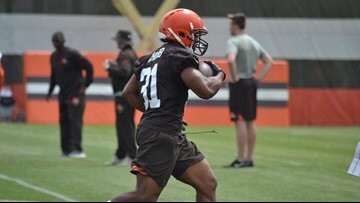 Cleveland Browns rookie running back Nick Chubb looks for a rushing lane while taking a handoff from quarterback Baker Mayfield in a drill during an OTA practice at team headquarters in Berea. In order to fix the troubles they had against the Giants, the Browns put in plenty of work on the run game during their four days of practice ahead of tonight’s game. Playing against the Giants was Bitonio’s first foray at left tackle in the National Football League, and while he was blocking the edge rushers, rookie offensive lineman Austin Corbett was starting at left guard. As the preseason continues and training camp winds down, Bitonio is confident the chemistry with his former University of Nevada Wolfpack teammate will develop and lead to more success in the run game. “He’s a good player, and I think when a couple good players get together, you can have some good double-teams and stuff,” Bitonio said. The 6-foot-4, 306-pound Corbett cleared the way for a Nevada offense that averaged 28.1 points and 397.6 yards over their 12 games in the 2017 season. Behind Corbett’s blocks, Nevada’s offense gained 4,771 yards and scored 45 touchdowns on 813 total plays. “He’s done a good job, but he’s a little aggressive still,” Bitonio said. “I think he thinks like, ‘Oh, guard. We’ve got to be super, super physical,’ and there’s a finesse to it still. He gets his head involved a little bit sometimes. Just little things like that, where it’s a nuance of the game.